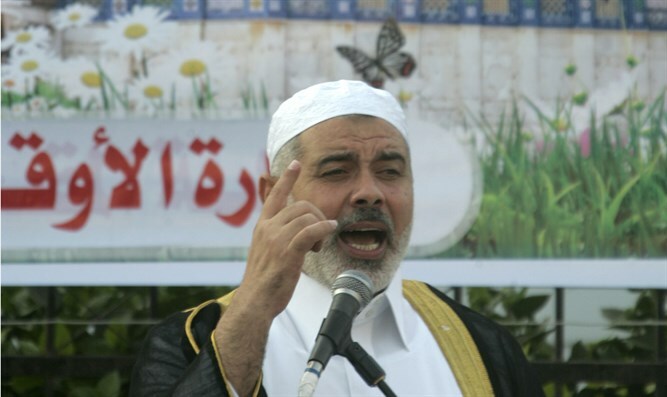 Israeli warplanes strike offices of Hamas chairman Ismail Haniyeh as retaliation for rocket attack continues. Israeli warplanes attacked the offices of Hamas chairman Ismail Haniyeh in the Rimal neighborhood of the northern Gaza Strip. The building which was attacked serves as an office for many military meetings and was previously attacked during Operation Pillar of Defense in 2012. "This is a central governmental asset used by the Hamas terrorist organization, which was attacked in parallel to the IDF's ongoing attacks in the Gaza Strip," it said. Earlier, a five-story building was attacked in the Rimal neighborhood of the northern Gaza Strip. The building was used by Hamas for military purposes, such as the Ministry of Public Security. Israeli fighter jets also attacked a three-story building in the Sabra neighborhood of the Gaza Strip. The IDF said that the structure attacked was a secret headquarters of the Hamas terrorist organization, which serves the general security, general intelligence and military intelligence of the organization, and that the Hamas military intelligence department is responsible for intelligence gathering and research against the State of Israel. The attacks were carried out in response to the rocket fire that hit a house in the town of Mishmeret this morning, injuring seven people.